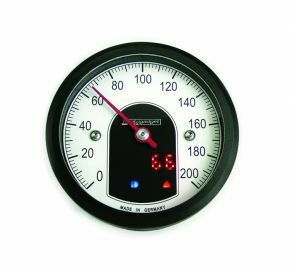 The motoscope tiny is a very compact, analogue 49 mm (1.93”) speedometer. The installation diameter of 49 mm (1.93”) and the installation depth of only 24 mm (1”) provide various installation options. The high quality aluminum casing is machined from solid metal and its surface is anodized black. 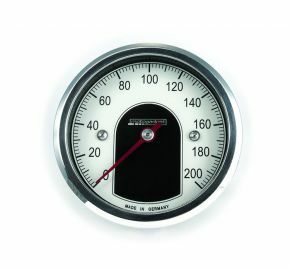 The bezel is also available in 'anodized black' or 'mirror polished'. The casing is 100% water-tight and resistant to vibrations. You can toggle between the different information on the LED display by operating the supplied menu push-button or e.g. the headlight flasher push-button on the handle bar. An intelligent 'Teach Function' allows for the easy calibration of the speedometer - even on vehicles with transmission sensors, e.g. Harley-Davidson (TM).